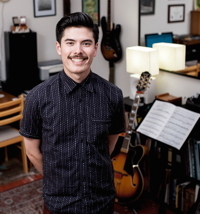 Over the past decade, William Seiji Marsh has contributed his guitar skills to many of the Pacific Northwest’s up-and-coming and staple artists. William has performed in Europe, Australia, and East Asia, as well as throughout the United States in a wide variety of genres. He was an adjunct instructor of jazz guitar at Willamette University in Salem, Ore. in 2012, and prior to that he was co-owner/-director of Harmony Roadhouse Music Studios in Eugene, Ore. from 2008 to 2010, where he also maintained a private studio. William currently performs in Portland and beyond with Morning Ritual, Lost Lander, Halie Loren and others, while maintaining a private lesson studio at the Falcon Art Community in N. Portland.